PORT ST. LUCIE — Jewelia was created as a simple fundraiser for the HANDS clinic in Fort Pierce. 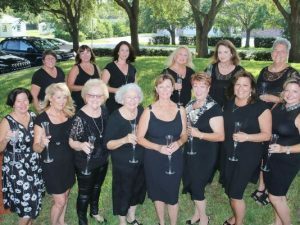 It is a unique project based upon the nonfiction book by Cheryl Jarvis called “The Necklace.” Twenty local women have teamed up to raise awareness of services and raise funds for HANDS of St. Lucie County, a free health care clinic serving low-income, uninsured, adult residents. In the book, Jarvis tells an unusual story of 13 women who agree to collectively purchase an expensive diamond necklace, and share it. As a result, a story of love, friendship, jealousy and rivalry develops. Wendy Dwyer read the book and knew the concept could be adopted and used as a fundraiser for a local nonprofit. She contacted Greg Childress, owner of G. Alan’s Fine Jewelry & Coin, and then contacted Sydney Liebman at HANDS. The three volunteers introduced 13 local women to the concept and all agreed to commit the next 13-months to what is now known as The Jewelia Project to benefit HANDS of St. Lucie County. The list of ladies of Jewelia included Wendy Dwyer, writer and IRSC instructor; Bunny Webb, Martin Health System Foundation board member; Pat Merryman Alley, Children’s Services Council board member; Jennifer Strawn, community advocate; Maria Seidel, IRSC nursing instructor; Sandee Allen, Humane Society of St. Lucie County board member; Jeannette Weiss, owner of J Weiss PR and Roseann Gregory Foundation board member; Cris Adams, retired vice president of United Way of St. Lucie County; Tia Victoria Adkins, community activist; Veronica Tempone; IRSC instructor; Mia Batalini, Fort Pierce Jazz & Blues Society board member; and Sue-Ellen Apte Sanders, St. Andrews school instructor. Since the beginning, new ladies have been added including Deejay Gardnerr of Gardner Lock & Key; Debora Ruocco Thompson of Senior Helpers; Lisa Rymer, formerly of Treasure Coast Newspapers; Linda Evans of the Public Defender’s Office; Tina Klein of Dyer Chevrolet; Kathy Post of Post Insurance; Gail Flesche, former commodore of the Pelican Yacht Club; and Pamela Tempone of Harbor Community Bank. The Jewelia Project also includes Greg Childress, who donated the nearly four-carat diamond necklace and matching earrings. Each of the ladies has agreed to “buy in” to the project with a minimum commitment of $1,000, and each agreed to host an event during her month of ownership of Jewelia, at which HANDS was introduced to a new audience. More than $262,000 has been raised by the Ladies of Jewelia, which equates to $3.8 million in patient care services — a phenomenal return on investment. To learn more about HANDS or The Jewelia Project, call Sydney Liebman at 772-462-5652.